CHALKFEST AT ARBOR LAKES RETURNS! Maple Grove Is the Canvas for EVEN MORE High-Profile Chalk Artists from Across the Globe! Chalkfest at Arbor Lakes, presented by Minneapolis Northwest Tourism, is a free, 2-day street art festival with entertainment, food, and family fun! It features sidewalk chalk art by professionals, amateurs & art enthusiasts from across the world! 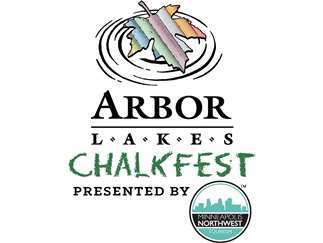 Chalkfest Arbor Lakes takes place on June 8-9, 2019 (10-5 both days) and is located on Main Street in Arbor Lakes. Chalkfest will feature sidewalk chalk art by professionals, amateurs and art enthusiasts from across the world. More than 40professional street artists will travel to Main Street Arbor Lakes in Maple Grove from around the country and featuring artists from Colombia, Mexico and Ukraine to showcase their amazing talents! Chalkfest also features local artist-in-residence Shawn McCann who is a co-founder of the festival. Shawn graduated from the Minneapolis College of Art and Design with a BFA. Shawn’s work has encompassed: street painting, murals, fine art, children’s books, installation art, temporary and permanent art. He has been featured at numerous street painting festivals around the world. Shawn was one of the 14 artists handpicked to participate in the March 2018 Dubai Canvas 3D Art Festival, one of the most prestigious art festivals in the world as it showcases the best street painters from countries around the globe, including Pakistan, Russia, Germany, the U.S. and South America. In addition to McCann, seven other artists that have been a part of Dubai Canvas in recent years have been at Chalkfest at Arbor Lakes, including Dave and Shelley Brenner, Sharyn Chan, Ruben Poncia, Adry Del Rocio, Carlos Alberto, and Alex Maksiov. In addition to Shawn, professional chalk artists from across the country and globe will travel to Maple Grove to showcase their work at Chalkfest Arbor Lakes. Don’t miss your chance to see these artists in action. Want to try your hand at chalking? Sign up as an amateur artist to create art on Main Street. The Chalkfest at Arbor Lakes jury will be awarding first, second and third place ribbons each for: Under 18 years of age, over 18 years of age. A 48 pack of professional grade chalk will be provided for all registered amateur artists.